I was out and about this week enduring some last-minute errands. I had a quick photo-shoot thingy downtown. The photographer asked what I did for a living. The short answer I give is, “I’m a writer.” That, however, almost always feels disingenuous. If I have more than a few minutes with someone, I explain a little more in-depth. I rarely have time (or anyone with enough real interest) to explain exactly what I do when I disappear over the summer. While many of you folks know way too much about my past six summers in Vegas, there are a lot of people who have expressed curiosity about what it is exactly that I do to make a living. I thought I’d bare-bones it here on the day before I leave for my annual trek to the World Series of Poker. This particular trip is different than the rest I take in many respects, but it’s notably among the most important of my gigs all year long. Poker media and close friends can check out now. You know the story already and probably have a lot of work to do. It’s still morning when I wake up on most days, but it’s later than most legit, straight folk would feel comfortable getting out of bed. I have no idea if it’s 1am or 1pm. The blackout curtains of my suite (a generous description of a hotel room if there ever was one) at the Palms Hotel and Casino work well, and my room is a cloth-draped birdcage. It will take me 20 minutes to convince myself to move the eight feet to the window and open the curtains, but when I finally do, I’ll rip the curtains open like a bandaid off an asphalt burn. Quick pain, quick acquiescence. I’m probably surrounded by my clothes, whatever I had in my pockets the day before (receipts, poker chips, random cash, and two or three business cards that I’ll never use) and the detritus of a man who ate a meal off a room service tray at 2am. The room will probably smell like dried clam chowder, shrimp tails, or the crusts of a half-eaten club sandwich. It’s the smell and the omnipresent feeling that I’m late that will force me into an unspectacular shower, into whatever clean clothes I can find in my closet, and out the door of the hotel room as quickly as possible. I’ll wear sunglasses in the elevator, because everything in Vegas is bright, my eyes are surely red and puffy, and because making eye contact with Vegas tourists at 10:30am is like catching the dead stare of someone who has just seen a tragedy unfold in three horrible acts. I’ll feel my ears pop as the elevator drops a dozen or more floors. Thirty seconds later I’ll be in the jingle-jangle of a million slot machines. I’ll meet my colleagues at a pre-designated spot. They will be well-rested, smiling, and probably sated with a light breakfast of yogurt and granola. It’s then we walk. We could take a cab, but the ten-minute walk always seems faster. Even though it’s probably already 95 degrees and we’ll be sweating by the time we reach our destination, it feels silly to ask a cab driver to drive us what is effectively across the street. So, we walk. We dodge the traffic on Flamingo without pausing to wonder whatever led casino owners or street namers to so emphatically honor the most ridiculous of birds. We could walk the Flamingo sidewalks to our destination, but, again, it’s in the 90s already and we won’t see a shower again for a very long time. Instead, we walk through the Gold Coast casino, a building that some years ago one of my co-workers dubbed The Old Coast. The casino isn’t crumbling yet. In fact, with the proper drinky lubrication, it’s almost charming. But at 11:00am, it just feels old. It’s filled with aged people wearing Terminator sunglasses, hobbling on walkers, and carrying cartons of cigarettes in their purse. Along our walk through the Old Coast, we play a game. We get a point for every smiling customer we can spot. By the time we’ve walked the length of the casino floor, the score is usually tied at zero. 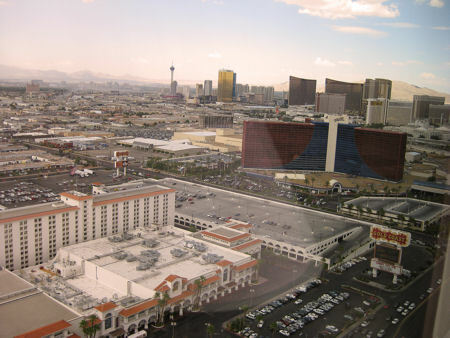 After that, it’s a walk through a parking garage, another dance across a busy Vegas street, and into the Rio Hotel and Casino. We’ll spend the rest of our day and night inside. And so this is the World Series. This is what I’m here for. 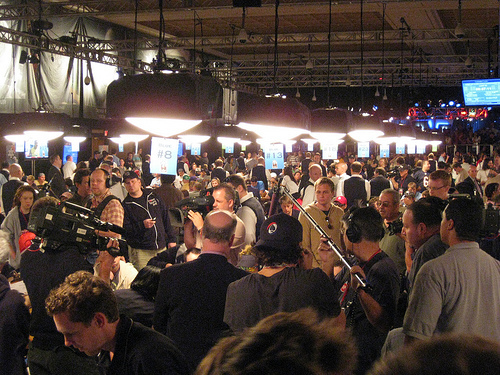 The World Series of Poker is the biggest event for poker players all year long. It’s been around in various forms for the past 40 years. It started as a little gamblers’ convention among a few high-rolling card players. Now, it’s a corporate-owned behemoth with big sponsorships and thousands of players. They play more than 50 events over the two months of the Series. Traditionally, the most important of these tournaments is the $10,000 Main Event. Each of the players who enter the Main Event puts up $10,000 for the privilege of a chair and a stack of poker chips. They will play No-Limit Texas Hold’em, the same game you see when you turn on ESPN at some odd hour and see folks playing cards. The players wager with the stack of chips they received for their $10,000. A player who runs out of chips is eliminated from the tournament. There are thousands of people to start. 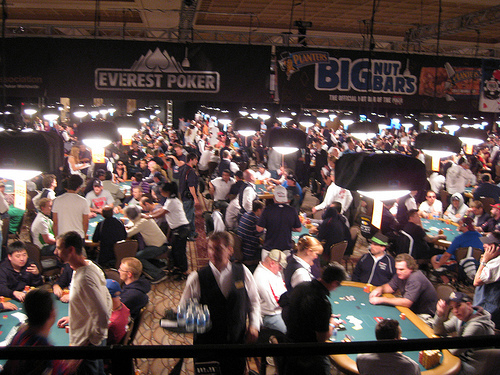 The biggest WSOP field ever was the 2006 Main Event. It drew 8,773 players. Most of the people who buy-in to the event will walk away with nothing. The top 10% or so will win some money. The big cash goes to the final nine players, all of whom will be millionaires. In 2006, the winner earned $12 million. In most cases, winning one of these modern World Series of Poker Main Events can set up a player for life. Not only does he get the money, but he will almost certainly earn a sponsorship (think NASCAR) and end up on the Tonight Show. So, it’s a big deal for a card game. 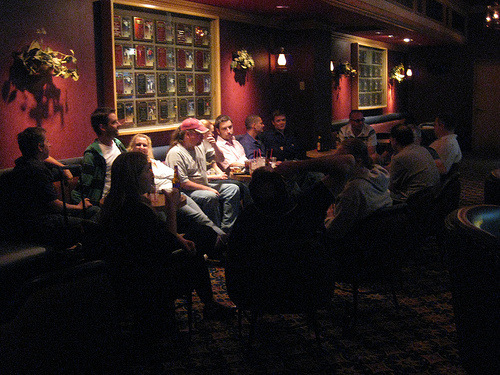 In 2005, I started a tournament reporting website/blog for an online poker company. 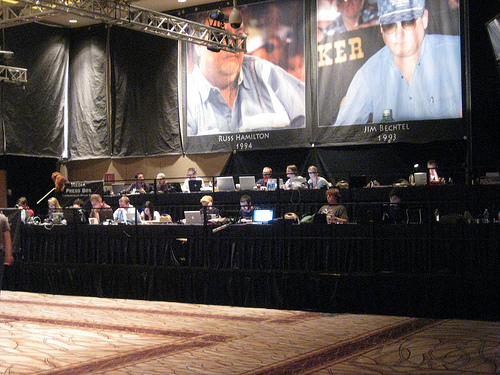 The PokerStars Blog has covered the WSOP Main Event every year since then. It’s both a news site and a service to the players who play at the online poker room. See, PokerStars runs qualifying events that allows its players to win the $10,000 entry fee (not to mention accommodations, travel money, etc) for pennies on the dollar. That means your average Joe can put up a few bucks of his own cash and get to play in the world’s biggest poker tournament. You might have heard of Chris Moneymaker. He famously turned less than $40 into $2.5 million in 2003 after winning a qualifying tournament on PokerStars. He’s also a pretty nice guy. It’s my job and the job of my colleagues to report on what happens in this tournament from beginning to end. The size of our staff has changed over the years. It started with just me. In our biggest year, we had a dozen or so people working to cover the event. 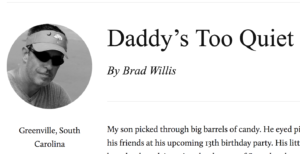 In the years since 2005, the blog has developed into a network of sites that are written in just about every language you imagine. So far this year, the WSOP coverage on the blog has been staffed by a couple of my colleagues since May. Beginning this weekend, the Main Event team–those of us who walk through the Old Coast–will start our work. The English language blog will be staffed by three writers and a photographer. We’ve worked together long enough that we’re more friends than co-workers. We know how each other works, we know each other’s abilities, and we know what everybody orders at the bar. We sit in a tiered press box among our fellow members of the poker media. Most of these folks have been on the job for the past six weeks. I used to do the long-haul two months in Vegas, but it eventually became too hard to leave my family for so long. Instead, I’ve become one of the people I used to hate. I parachute in for the Main Event, looking well-rested and free from the drama that comes with being locked in a building with the same people for eight weeks. For the first few days, I’ll have a hard time looking these people in the face. They are tragic heroes for their ability to survive the long haul. It’s an ugly world for two weeks. It’s nearly impossible over two months. The job goes like this: Outfitted with a parchment Moleskin notebook and a Sharpie pen, I wander through the thousands of people looking for stories. I’ll listen for great quotes. I’ll watch for interesting poker hands. I’ll do interviews when players aren’t busy. I’ll walk around for half an hour or so, then return to my computer to write up whatever I’ve seen. I’ll combine my work with that of my colleagues and we will write it up into something that looks like this. It gets posted to the internet and we start all over again. We will do that once an hour for however long the day lasts. Short days get us out of there by 9:30pm or 10pm. Long days…well, suffice it to say I’ve seen the sun come up on my way “home” from work. It sounds like a pretty cush job, no? Well, yeah, it’s better than digging ditches and provides a little more excitement than sitting in a cubicle. 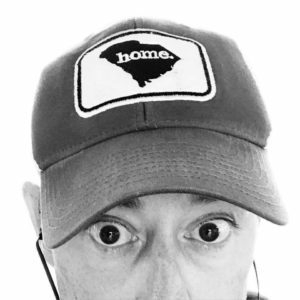 I learned a long time to not complain about the gig, because until you’ve done it for a couple of weeks, there is no understanding that it can actually be sort of difficult on both a physical and mental level. I’m fortunate that I no longer have to do the full two months like a lot of my hard-working friends. I’m also exceptionally lucky that I really enjoy the company of the people I work with. My co-workers are hard-working, centered, fun people and I’m lucky I get to work alongside them. The real challenge is writing about the same subject for years on end and finding a way to make it new and interesting. That’s my job, and I figure I’m lucky to have it. The main event of the WSOP lasts from July 5 to July 17 (it actually won’t end until November, but there is a four-month break that would take more time to explain than is really acceptable here). During those weeks in July, there is one day off. So, despite the fact I’m going to Vegas for the better part of July, it’s not a pleasure trip. There is the odd hour or two here and there in which I have time to myself. On the one day off, for instance, I’m going to a private party hosted by PokerStars (for a couple of thousand people, which makes me question how private it really is) in which Snoop Dogg will perform. Last year, Nelly was on stage. Before that, it was Dita Von Teese. It’s this kind of thing that makes my friends question how much work I’m really doing when I’m on the road. Most of the few off-hours, though, are spent in a few ways. I sit at a poker table trying to make some extra money, I sit at a bar BSing with my friends, or, on a few rare occasions, we gamble. That’s it. Otherwise I’m sitting in my room reading or watching something on Netflix. Because I’m me, I rarely go to bed before 2am. 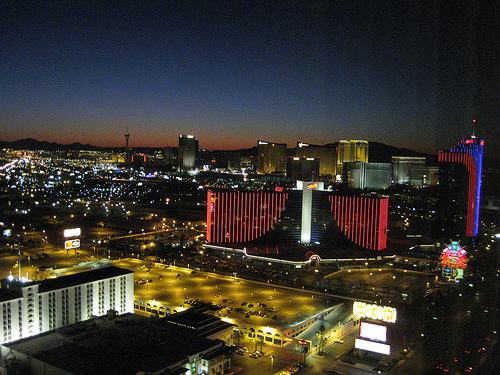 Each night when I go to sleep, I walk over to the blackout curtains, take one last look at my view of the Vegas skyline, pull the curtains shut, and climb into bed. That is how I spend my summer vacation. Call me whenever you get a chance and we can have a drink. Doesn’t matter what time. I don’t go to bed before sunrise most of the time anyway. Check your fb mail. My number will be there.